I've seen MANY wallpapers featuring Saber and most of them have backgrounds that bring out her main anime character [I'm not saying thath I don't like such wallpapers though :P]. So I decided to place Saber in a scene that brings out the mythological character she actually represents. So, there you have a castle in the plains with mountains in the distance [at least, that's how I imagined Camelot in Le Morte d'Arthur] as a background. The "cloudy sunset" atmosphere is from the mood the scan gave me. Saber looks very awesome in this wallpaper ! Really good job done on the bg, the setting of the castle is nice. Character brings out the tension even more. Conclusion, a good wallie^^ fav from me! It is very moody... and rather dark. nice wallpaper, the background looks very good, the colours are pretty and the scene is great. Wow! This is really a special Fate/Stay Night wall. My current wallpaper now. Thanks a lot for making it, it's amazing. And you didn't even add any cliched text. I love the castle, it completely fits Saber. The colours are easy on the eyes, and plus, Dark Saber! W00t. So hard to find good walls with her. Very sweet Dark Saber wallie, too bad we can't see her eyes, haha, awesome wallie ! That's Dark saber if I'm right, Faved. its nice how the scan fits your background so well. Wow... 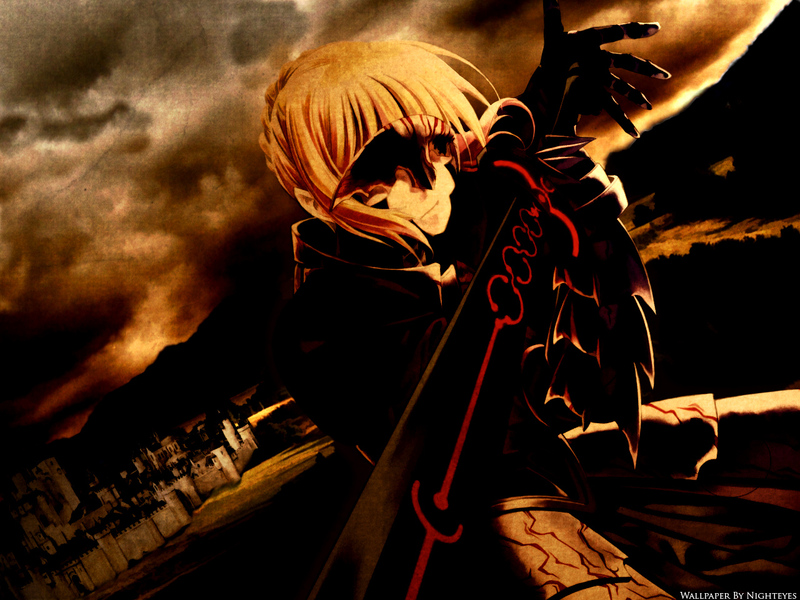 I've never seen a dark saber wallie like this one... It's absolutely cool... And the mood is just right with the background and all! This goes to my favs for sure... Thanks a lot for sharing! It is a picture with the atmosphere.